The bullet holes in the wall were not the reason why I visited the Museum Prinsenhof last July. In my heart, I keep a special place for Delft, the city where I was born. One of my wishes was to create a challenge, a treasure hunt in Delft. But, Delft has no festival based on a historical event or full of traditions. What could I do? Then came the request. Rowena had organised a group bike tour through the Delft nature with Verita’s Visit and enjoyed herself. After that she approached me and asked if I could create a city challenge in Delft. I was thrilled with the request. My dream of creating a treasure hunt in Delft came true. At the end it wasn’t difficult to come up with a theme. The exact location of the masterpiece The little street by Delft painter Johannes Vermeer had just been discovered and Museum Prinsenhof Delft had managed to borrow the painting from the Rijksmuseum. From 25 March until 17 July Prinsenhof dedicated a full exhibition on this painting of Vermeer and its location in Delft. The news spread like wildfire and local businesses, churches and other museums joined in by offering special Vermeer products and deals. Delft was under the spell of Vermeer. I had always wanted to work with Barbara van Gelder, owner of the studio Something Extra. In her studio you can become Vermeer or one of his characters. Dressed in 17th century costumes and some nice accessories added to the scene she will immortalize you in a portrait. Barbara has many ideas and is always enthusiastic. 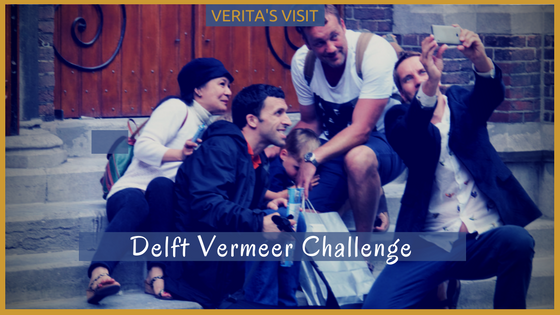 When I told her about the Delft Vermeer Challenge, she immediately came up with questions and assignments. The Delft Vermeer Challenge finished at a special place where, how could it be otherwise, the assignment was to become a Vermeer character, pick the right costume and get your portrait taken. Love to show you this unique place in Delft!